Because Komodo 8, the world's #1 engine, is distributed as an Android Chessbase compatible engine, it is immediately available for import in Chess for Android on your phone, tablet, or smart-watch, and in Chess for Glass on your Glass device. Many thanks to Mark, Larry, and Jeremy for making this amazing engine available. I wish I could have shared my excitement over this with Don too. 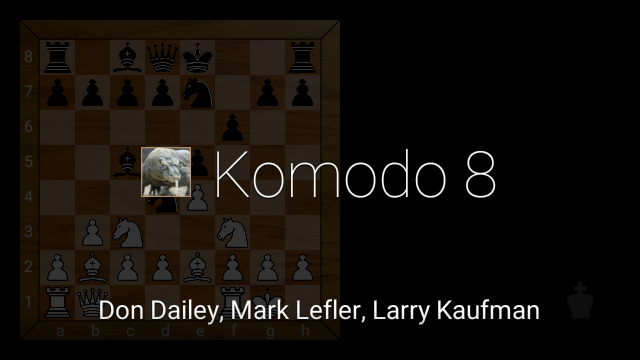 The extremely strong Komodo 8 chess engine is now available for Android (see the playstore link and the developers website). It runs directly in Chess for Android and potentially even in Chess for Glass (by sideloading the APK). How exciting to see this powerful engine available on my favorite platform!